Sounds like a good time! I love your banner. Thanks, Darlene! Had a friend design it – I’m clueless about that stuff. So much fun, Craig – still recovering. Awesome, I’m glad it went well. Costumes at Comic Cons are always a joy, aren’t they? I could have sat and people-watched all day, Matt. That was my first, but I’m betting not my last. They’re certianly addictive! Will you be joining in with the dressing up next time? Don’t think I’m creative enough to make my costume, Matt. It’s an accomplishment for me to sew on a button. 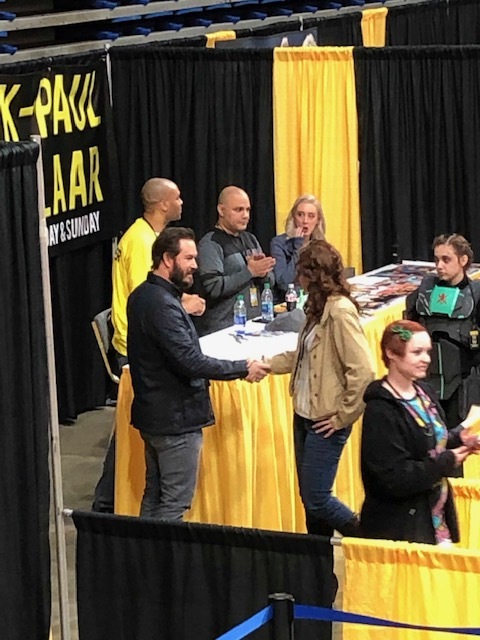 My oldest son has gone as The Punisher – he and a friend met Jason Momoa pre-Aquaman hype. LOL. Itcan be difficult to build bits in fairness, especially from scratch. Congratulations on a good book show. The banner looks great and it sounds like it was both fun and successful. Comic-Con looks like a blast. Beards are in, so I wouldn’t take that as proof The Passage is shooting season 2, but my fingers are crossed with you. Glad you got to see your son and his girlfriend and had such a good time. I was exhausted last night, Staci, but it was worth it. We had a great time. True – beards seem to be in right now. But still hopeful. 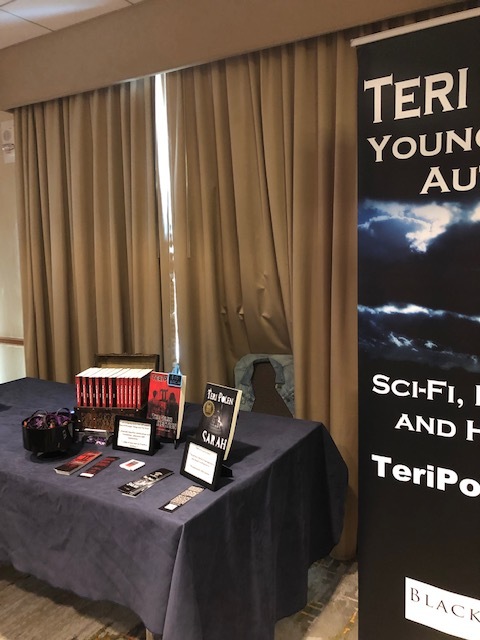 Looks like an amazing weekend, Teri! The banner looks great! Good that you were able to visit with your son and his girlfriend as well. So did this guy! The kids loved him, and he never broke character. There was even a Krampus, and the costume looked like it was straight out of the movie. You should try to go to one – I had no idea this was a yearly thing in Lexington. They seem to be all over the country. That’s so cool! This was in Chicago, but I almost wonder if it could be the same guy lol. You never know with this small world. I definitely want to go. I actually used to sew Renaissance costumes as a part-time job not too long ago and I’ve always had a thing for making costumes. So much fun! Kudos to you – like I told Matt above, it’s an accomplishment for me to sew on a button, lol. I admire anyone with the talent to make those costumes – or sew at all! Sounds like a good time, all around! It sure was, Dan – fun was had by all. 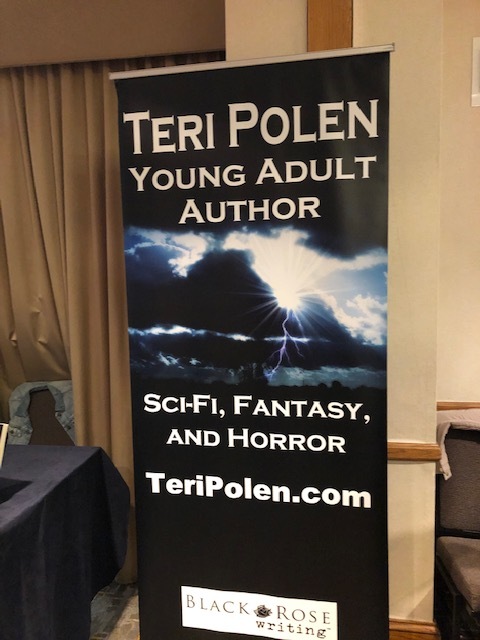 Your banner looks terrific, Teri. I’m glad you had a good time. I’ll give my friend you compliments, John – she did a fantastic job. I love your new banner, Teri. It sounds like a most successful book festival. Thanks, Robbie – so much fun! And so many books! Happy to hear that you had a great time! We really did, Evelyn – I recommend everyone try a Comic-Con at least once. Oh i’m so jealous – that sounds like so much fun! 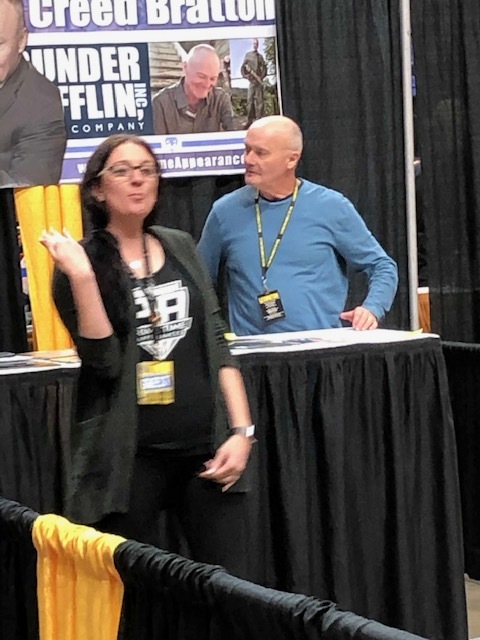 What’s strange is that my son has lived in Lexington for the past 7 years, and this is the first time he knew of a Comic-Con being held there, Jina. Now he’s mad he missed so many, lol. I know, right? A double dose of my favorite things, Mae. Sounds like a totally awesome weekend! Busy and exhausting, but tons of fun, Tori.